In unprecedented event, Brazil will host the first Memory Tournament in Latin America, held by Farrow PR and Nigma. In order to encourage Brazilian youth to train and test the limits of the human brain, and popularize memorization techniques – which are excellent in the learning process – the event which unites knowledge and entertainment, it will be divided into two modules: a lecture on memorization techniques and the championship itself. There will be a special award for the top three finishers in each category of the tournament, and also to the school with the highest number of classified students. 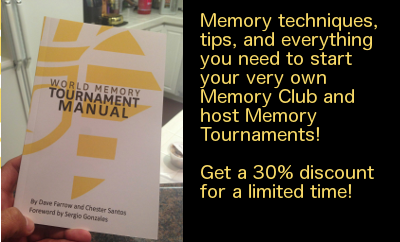 Hosted by the EBay memory Club the US open memory tournament is a great opportunity to have fun while pushing the limits of the human brain. The EBay memory club was created by Sergio Gonzales (head of innovation at eBay) to inspire others in the highly competitive world of Silicon Valley to take up memory training as a way to expand their abilities. A long time life hacker Sergio is always looking for different strategies to improve life and is responsible for our mission statement to make practical memory available to the masses. This is two events in one! In keeping with our goal of getting new people into the game; the first half of the program starts with a seminar/workshop on memory techniques and the Farrow Memory style game. The second half is the Memory Tournament itself. At this event an American Champion will be chosen. Other titles can be won as well like best in category and best international player. Hosted by the EBay memory Club the World open memory tournament is a great opportunity to have fun while pushing the limits of the human brain. The EBay memory club was created by Sergio Gonzales (head of innovation at eBay) to inspire others in the highly competitive world of silicone valley to take up memory training as a way to expand their ability’s. A long time life hacker Sergio is always looking for different strategies to improve life and is responsible for our mission statement to make practical memory available to the masses. At this event a World Champion will be chosen. Other titles can be won as well like best in category. The Official memory tournament for Canada and our longest running event. Dave Farrow started his first memory club in his own high school in Canada in 1996. The first event raised $2000 for the united way charity. Today over 20 years later Farrow Memory Tournament have held hundreds of events across Canada. This, our official Canadian tournament exists not to show off but to inspire people of all ages to discover practical memory skills beyond the sport. This is two events in one! In keeping with our goal of getting ne people into the game the first half of the program starts with a seminar/workshop on memory techniques and the Farrow Memory style game. The second half is the Memory Tournament. At this event a Canadian Champion will be chosen. Other titles can be won as well like best in category and best international player. The hosting organizer is the Brain Expansions Scholastic Training Program, Inc(B.E.S.T.). It is a vital 501(c)(3) nonprofit organization that attempts to moderate the negative impacts of apathy and lack of available education services on the under served youth population of Tampa, Florida and beyond. The BEST program has encountered disadvantaged youth to focus on careers in the medical profession and has provided an educational learning curriculum as a vehicle to empower success for these students in fulfilling their dreams. BEST Inc is interested in broadening its impact by changing the approach to learning that students are normally used to. We would like to expose everyone to Dave Farrow live and learn the strategies he used to rocket himself into the Guinness Book of World Record. Dave’s techniques work and you will be the proof. He will help triple your memory power, learn to absorb foreign languages, learn how to memorize names, improve you grades or work performance and learn memory techniques to succeed in business. Even though our sights are set on the future, sometimes it’s useful to take a look back. 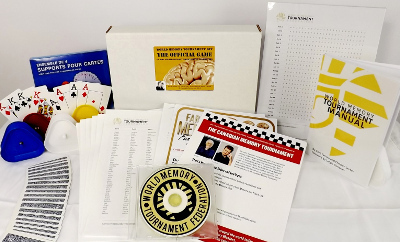 Farrow Memory Tournaments were founded with the goal to democratize practical memory training. To make real memory training accessible to novices to help students perform better and adults remember more. We started with private tournaments held at colleges, clubs, and organizations and grew to global open tournaments that inspire and inform people around the world. Get Your WMTF Club Kit!